Information: The relaunch of the Tatsunoko Time Capsule postcard line included five new original postcard drawings. The cards were packaged in a resealable plastic bag. 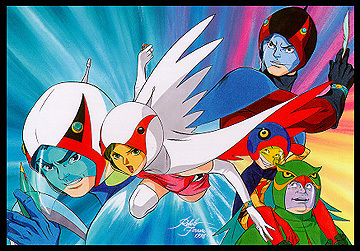 Of the package of five, there was only one "Gatchaman" card included, which was illustrated by Roberto Ferrari. This image was later reused as a puzzle image on some promotional trading cards. To see the cards, click here.